Occasionally, when you’re making a lot of design changes to a Microsoft Access database, Access might start crashing when you’re working with that specific database file or when trying to enter the VBA environment with ALT-F11. This leaves you unable to investigate the issue or make further changes. It can be a sign that there are errors within the project’s compiled VBA code. One solution is to use the /decompile switch to remove the compiled VBA code from the project and then recompile the source code. 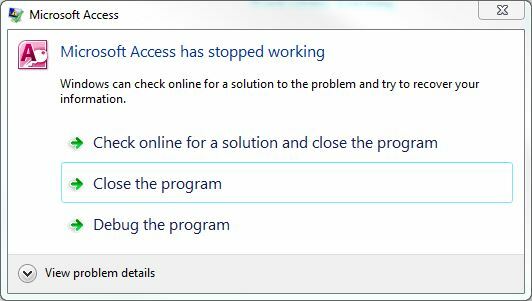 Like other Office applications, Microsoft Access can stop working for various reasons. Sometimes, it’s due to a kind of file corruption that’s unique to Access. If you’re doing ongoing design work with Access, I recommend creating a new shortcut to the MSACCESS.EXE file on your system with the decompile switch. You would use this only when trying to recover a file. The rest of the time, you should use the normal menu shortcut. You can also enter this with the Run command on the Start menu and include the path to your database file after the /decompile switch. The first file that you open after running Microsoft Access with this switch will be decompiled. This will not delete the source code behind your forms or reports but it will remove the compiled version of the code and might enable you to get back into the VBA environment. The Debug >> Compile Database command compiles all of the VBA code and alerts you to potentially fatal errors. Once you’re in VBA, use the Debug >> Compile Database command to recompile the database project. This will enable you to find and correct any problems within the code. As always, be sure to make regular backups of your files as you’re coding in case this doesn’t work and you have to recover. Also be sure to make a backup of the file before you try to decompile it in case something goes wrong. If this doesn’t work, then the last resort is to rebuild your database by importing all of the objects within it into a new database file. This is time consuming, however, although it does seem to remove a lot of temporary data that Access stores in the file, reducing the database size substantially in some cases. While you’re here, check out some of the other articles on Microsoft Access right here on ComeauSoftware.com. This entry was posted in Database Design, Microsoft Access and tagged Microsoft Access on January 18, 2016 by Andrew Comeau. 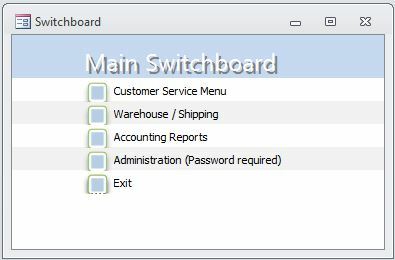 The Switchboard Manager in Microsoft Access makes it easy to create a system of menus that will enable your users to navigate through your application. It also relieves you of the need to manage multiple menu forms and macro calls. Sometimes, however, you might want to keep all but a few users out of specific areas, even if it’s just a password to discourage the curious. This is one thing the Switchboard Manager doesn’t offer and I’d like to show you one method for achieving this here. I want to stress that this method is not truly secure. On it’s own, it won’t prevent a user from hitting F11 and browsing through the database. A power user who wants to see those areas could defeat this method pretty quickly. It will keep the merely curious and inexperienced users out, however, and could be combined with other measures to add more security. This entry was posted in How-to, Microsoft Access, Programming and tagged Microsoft Access on November 2, 2015 by Andrew Comeau.